First off, let me start by saying that waking up in a bed & breakfast is one of the best feelings. Even with a slight hangover, I couldn't help but enjoy waking to the smell of breakfast cooking, bacon, eggs, coffee. It was absolutely amazing. After getting ready and getting some food in my belly (I'm not much of a breakfast person, but I do enjoy the smells! ), we headed over to start our tours. The first stop on our tour was Buffalo Trace Distillery. I finally got my chance to see the stacks and stacks of barrels aging in the rickhouses. I was amazed at how cramped those places are and how low the ceilings are. They really pack those barrels in there, which makes total sense of course. I don't know what I expected, but I couldn't help but take notice of those tight quarters. We also got to see the hand-bottling line in action as a dozen or so workers operated the assembly line, filling, sealing, labeling and packaging some Blanton's, right in front of us! Acetone smell aside, this was definitely one of the cooler parts of the tour. And, of course, we got to do a tasting at the end. They shared some Wheatley Vodka, White Dog, Buffalo Trace, Eagle Rare and Bourbon Cream. The White Dog and Bourbon Cream were both firsts for me, and both at very opposite ends of the spectrum. White Dog is some powerful stuff, with an incredibly strong alcohol burn at the back. I couldn't really blame the bachelor party that was on the tour with us for downing them like shots. The Bourbon Cream, which I've never had before, was absolutely amazing paired with the root beer they provided us. All in all, my first distillery tour was a great experience, even if I was a bit disappointed by the limited selection of bourbons at the gift shop. From there we went to Four Roses. As our tour guide noted heading there, it really does look out of place. The buildings have a Spanish style to them that makes them look like they belong somewhere in Southern California, and not in the hills of Kentucky. It's a beautiful facility, though. Although we did not get to do a full tour there, we did get to enjoy a very nice tasting outside under the pavilion. Even though I've had all three of the bourbons we tasted many times each, this was still one of the more well-done tastings of the entire trip. 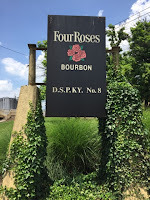 As a bonus, Four Roses was very generous with the souvenir glasses they let everyone take home, even wrapping up extras for those that wanted them. I also picked up an private single barrel OBSK hand-selected by Brent Elliot, their master distiller, exclusively for the gift shop. After a lunch at Staxx BBQ (delicious! 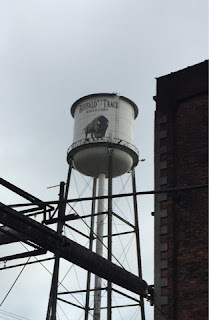 ), we then headed to Wild Turkey. I was initially impressed simply with the sheer sprawl that their facilities have. Their piece of property is huge and has incredible views of the river. The tour was pretty amazing as well, particularly seeing the incredibly large-scale distillation plan. Plus, it ended with a great tasting where nearly their full line was made available to choose from. 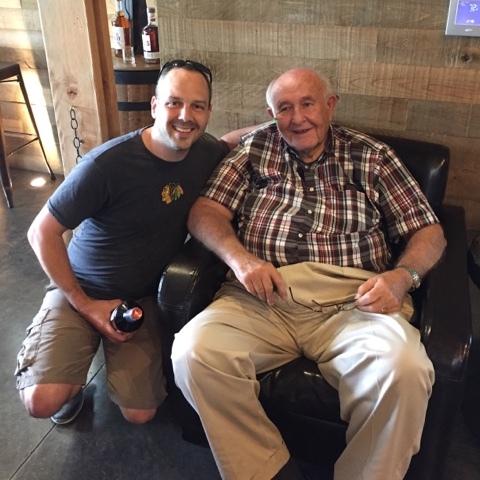 The highlight of the day, however, was walking into the visitor center and seeing the legend, Jimmy Russell just hanging out in a chair off to the side. He was the nicest man--had a photograph, an autograph and a smile for everyone there, and the place was packed. I would have loved to take the time to talk to him a bit, but he was clearly busy being a man of the people. I wish I had a few more paragraphs to write about the night we had after that, but, to be honest, eventually it all kind of blurred together, especially as I finish this post a couple days removed. However, I did make it to a couple liquor stores to finally grab some of those bottles that just don't make it to Illinois for one reason or another. I picked up some Mellow Corn, Evan Williams Bottled-in-Bond, and Heaven Hill Bottled-in-Bond. At the first store I went to, I specifically asked for the Heaven Hill BIB, but the owner told me the stuff is getting hard to find, even in Kentucky. I was a bit deflated, as I was particular on the hunt for a couple bottles of that stuff. So I left, walked about a block and a half to the next store, and this hard-to-find-even-in-Kentucky stuff was everywhere I looked, on the shelves in numbers, and even on a display by the register. I was thrilled and could only laugh at the response I received at the other store.